The US has vowed to replace 10% of total electricity by alternative energy sources by 2012. While it’s called “alternative energy,” we’re really talking about harnessing the primary energy sources for all life on earth. Alternative energy sources need not be dug out from obscure corners of scientific journals. They are all around you. Sunlight, tidal energy, wind, biofuel and geothermal heat are readily available renewable resources. Being harnessed from nearly infinite natural sources, alternative energy can never be subject to price spikes or demand-response curves. We also live in an era where most of these technologies are becoming cost-competitive with fossil fuels. Comparatively, non-renewable fuels are limited in quantity and will inevitably cost more as time goes on. Natural sources will never be exhausted until the sun burns out or the Earth’s core freezes, so once the technology to capture it is in place there will never be a shortage of renewable energy. What’s more, alternative energy sources can be harvested individually, at point sources, as well as in centralized plants–creating independent and inherently more stable power units. Research has shown that an hour of uninterrupted bright sunshine is more than adequate to satisfy our annual electricity needs. Thousands of daylight hours are essentially wasted by by not harnessing this solar energy. 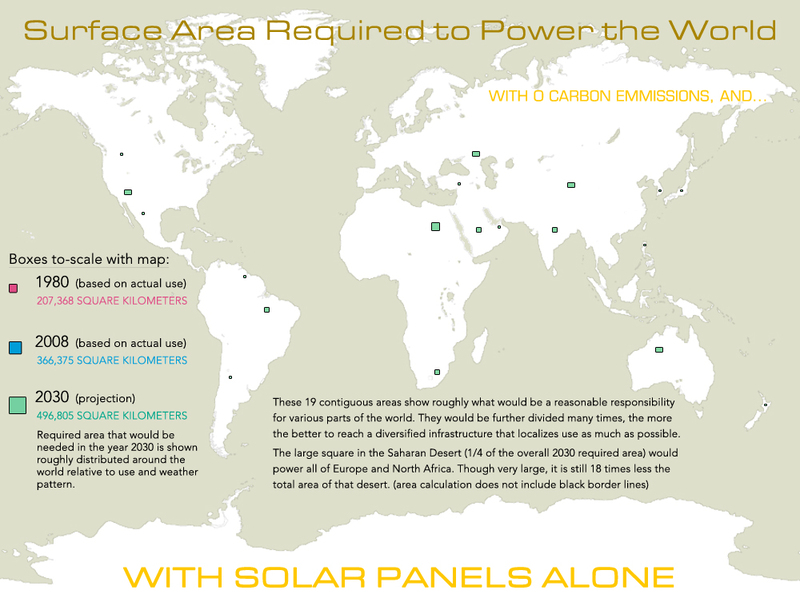 In fact, it has been found that a relatively small amount of land area could provide this energy–assuming we had the solar energy generating capacity in place globally.